Samsung rumored to launch Galaxy S6 Edge with two Edge displays | Android Blast! 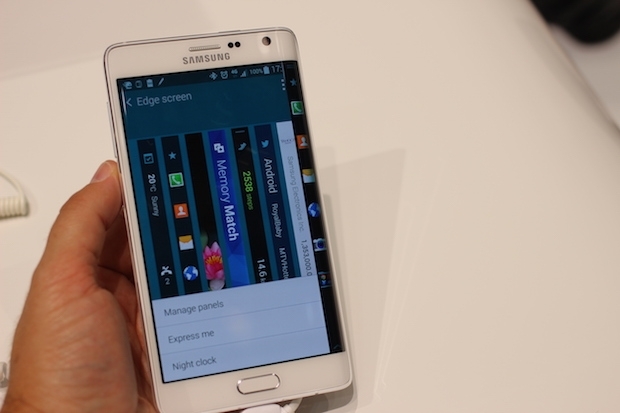 Samsung released the Galaxy Note Edge last year as a proof of concept of sorts. It was an effort at showing the world its innovation chops. Whether a curved display is needed or wanted is up for debate, but Samsung looks to be pushing the envelope a bit further. A rumor is floating that Samsung will release a Galaxy S6 Edge phone with two Edge displays. There will supposedly be an Edge display on each side of the phone. Samsung will continue to produce regular Galaxy S6s, but will have a special variant of the S6 with Edge displays. The software feature set of the Galaxy S6 Edge is very similar to the one found on the Note Edge. However, Samsung did throw in some new features to make the S6 Edge a little unique. First of all, you will have the ability to activate the main edge panel on the right or left curve, depending on your primary hand. Then there�s Glance Lighting, which will light up the Edge area when you receive a call or notifications, when you turn your device over. Also, you will have an option to choose favorite contacts and an ability to assign specific colours to them. So, calls and notifications from important people will show the designated color lighting on the edge area. This report is obviously a rumor at this point. It is possible that Samsung could develop the Note Edge instead of a Galaxy S6 Edge, but it seems like they will continue down the "Edge" path.